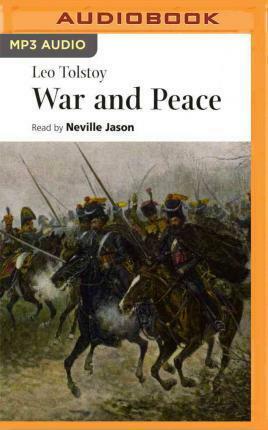 WAR & PEACE, Volume IThe Neville Jason performance of Tolstoy's War & Peace was selected as a Top 12 Fiction title for Best Audiobooks of 2007 by AudioFile Magazine. War and Peace is one of the greatest monuments in world literature. Set against the dramatic backdrop of the Napoleonic Wars, it examines the relationship between the individual and the relentless march of history. Here are the universal themes of love and hate, ambition and despair, youth and age, expressed with a swirling vitality which makes the book as accessible today as it was when it was first published in 1869. In addition it is, famously, one of the longest books in Western literature and therefore a remarkable challenge for any reader. Translated by Aylmer and Louise Maude. WAR & PEACE, Volume IIWar and Peace is one of the greatest monuments in world literature. Set against the dramatic backdrop of the Napoleonic Wars, it examines the relationship between the individual and the relentless march of history. Here are the universal themes of love and hate, ambition and despair, youth and age, expressed with a swirling vitality which makes the book as accessible today as it was when it was first published in 1869. Neville Jason read the abridged version of War and Peace and proved his marathon powers with his outstanding performance of Proust's Remembrance of Things Past. These alone make him the ideal person to essay Tolstoy's epic. The recording runs some seventy hours, and has been divided into two volumes. Translation by Louise and Aylmer Maude.